For any teacher, I think it's such a good idea to write down and teach your routines and procedures for the first weeks of school. I even give a quiz on my routines and procedures in the first month of school. 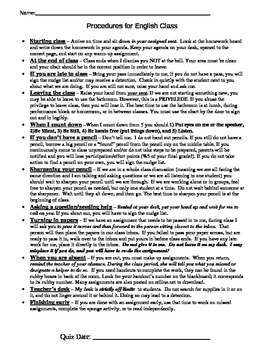 I think that this procedures list, which I hand out to students in the first few days of school, may be helpful for any teacher (especially new teachers) who want some ideas of routines or procedures they may want to use in the classroom.